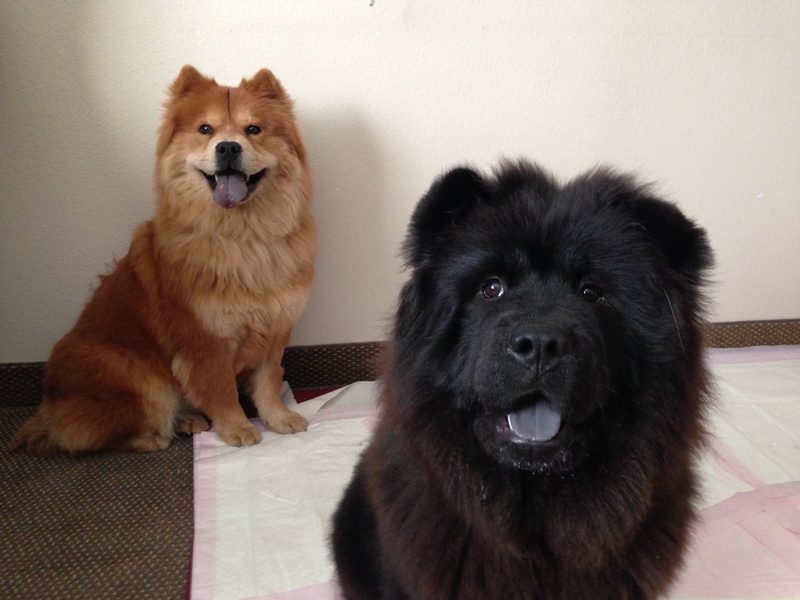 Brynnah (Left) is a two-year-old Chow who is fearful of and runs / shies away from new people. Talon is a five-month-old Chow who is starting to pick up some of Brynnah’s habits. Knowing that Brynnah was uneasy with people she didn’t know, I made sure to display non confrontational body language and moved in a slow and deliberate manner. I also took care to avoid direct eye contact and paused or waited for her to look my way when I moved to make sure I didn’t surprise or startle her. Chows are known to be more reserved and wary of strangers, but Brynnah’s behavior went well past that. Initially she stayed several feet away from me with a tense body posture, wide eyes and dilated pupils. By keeping myself turned so she was on my side and the use of calming signals, I was able to get her to relax a little as I discussed the situation with her guardian. The dogs and their guardian recently moved here, but the house wasn’t ready when they arrived so they have been living in a hotel. This is the first time I have done a session in a hotel and for a dog with Brynnah’s issues wasn’t ideal as I like a dog to be in a safe calm place for my session. Usually this is the dog’s home, but in this case, the surroundings were as new to her as they were to me. As she paced around the end go the room, it was clear that I needed to help her achieve a more relaxed state before I could really get a good read on her. I got down on the floor with the dog on my left side to help make myself more approachable. I wanted her to get close enough to get curious about my scent. As I sat on the floor and let both dogs approach and get a good sniff of me and the dog smells that were on my pants and boots, I discussed a number of small changes that her guardian can make to their day to day life to help get the dogs to see and respond to their guardian in a follower position. Adding and enforcing some simple rules, boundaries and limits and will help the dogs start to see a distinction between their status and that of their guardian. Each time she corrects them or disagrees with unwanted behaviors, she builds a stronger leader follower dynamic. When you have an insecure dog, adding structure and discipline goes a long way towards helping them relax. Seeing themselves as having less authority translates to less stress as they don’t feel the need to lead and protect the humans. I also noticed that the guardian wen tout of her way to do things for Brynnah that were too far. I had tossed a treat on the floor a few feet in front of Brynnah who was sitting across the room on the other side of her guardian. She looked at the treat and started to get up out of her sit then stopped and backed into a sitting position while staring at the treat. Her guardian instinctively picked up the treat and dropped it right in front of the dog so she could lean over and lick it up. Dogs get over things by literally moving forward. I had tossed the treat a few feet in front of her intentionally to get her to get up an move forward. Wil it may seem like a kindness to pick up the treat and bring it to the dog, this was actually stopping her from moving forward figuratively and literally. I suggested that the guardian look for ways to motivate Brynnah to literally get up and move forward. I showed her how to use her other dog Talon toy help in that regard. By only offering one treat for a recall command and rewarding the first dog to obey, she can channel competition to motivate her dog to move forward and interact with her guardian rather than waiting to be catered to. At first Talon was getting all the treats I offered, but after a few minutes Brynnah realized she was missing out and came over to claim a treat from my hand. As we discussed how to use competition to get Brynnah more engaged, I learned that she only really knew two commands; sit and come. Because dogs feel a sense of pride and accomplishment when they master a new skill, I suggested that her guardian find a new command or trick on Youtube each week for the next two months. In addition to increasing the self esteem and confidence, teaching Brynnah and Talon these tricks and commands will deepen the bond between dog and guardian and build up their respect for her as an authority figure. Talon was already starting to pick up on some of Brynnah’s unbalanced behaviors, so introducing some tricks and commands will help the dogs start emulating actions that are wanted instead. I also strongly suggested that her guardian sign Talon up for a puppy socialization class ASAP. Not only will this help with basic obedience, the play and socialization with other puppies will be a positive impactor on her outlook and behavior. The more exposure he gets to new people, dogs and situations, the more confident and self assured he will be. Another great activity that can enhance the leader follower dynamic is a structured walk. But the state of a dog’s mind on the walk is almost as important as its position so I asked their guardian to show me how she gets the dogs ready for one. While these aren’t the most excited dogs I have ever worked with, they were over stimulated. You could see them moving towards the door in front of their guardian before she attached the leashes. This is a small example of the dogs thinking they are in the leadership position. You could also see how the excitement impacted their behavior by the number of times the guardian had to ask the dogs to sit so that she could attach the leash. Many people misinterpret excitement for happiness. While an excited dog can be happy, often they are just over stimulated. And just like people, an over excited state isn’t the best behaved state of mind. We practiced the leashing exercise until she was able to get her dogs to remain completely calm throughout the entire ritual. Now that she can get the dogs leashed up while keeping them completely calm, I showed their guardian how to add a special twist of the leash to giver her more control of the dogs. I wanted to show her hot to get them to walk with her in a heel position. While many people allow their dogs to walk in front of them, this is a leadership position in the dog’s mind. If the dog is in front, it is usually more reactive to other dogs and people they don’t know. By the time we returned from the walk, we were already seeing small differences in her behavior. Brynnah was still anxious, but she seemed more relaxed and confident than when I started the session. As her guardian continues to engage in actions and behaviors that help the dog identify her as the leader, Brynnah’s anxiety and stress levels will decrease. Talon is the wild card in this situation. Being a puppy, he is still developing his personality. If he is socialized around other balanced dogs and his guardian builds up his confidence with new tricks and commands, he can grow to become a balanced dog that positively influences Brynnah’s behavior.